In an enterprise data center, the compute cluster is the data processing center or the brain of the business, and the network infrastructure connecting the clusters is the central nervous system of the business. A business can expand its horizons by embracing technology that will make it nimble and ready to step up to the next level – making the design and implementation of data center technologies a top priority for IT departments to provide the requisite agility. Facing the complex challenges of scale, management and performance, IT managers need to be able to incorporate best of breed solutions to meet the demands of a fast-moving enterprise. To meet and exceed these demands, the Extreme Networks team is at the Nutanix .NEXT conference in London this week to announce that Extreme Networks SLX and VDX series data center switches have been certified as Nutanix Ready. 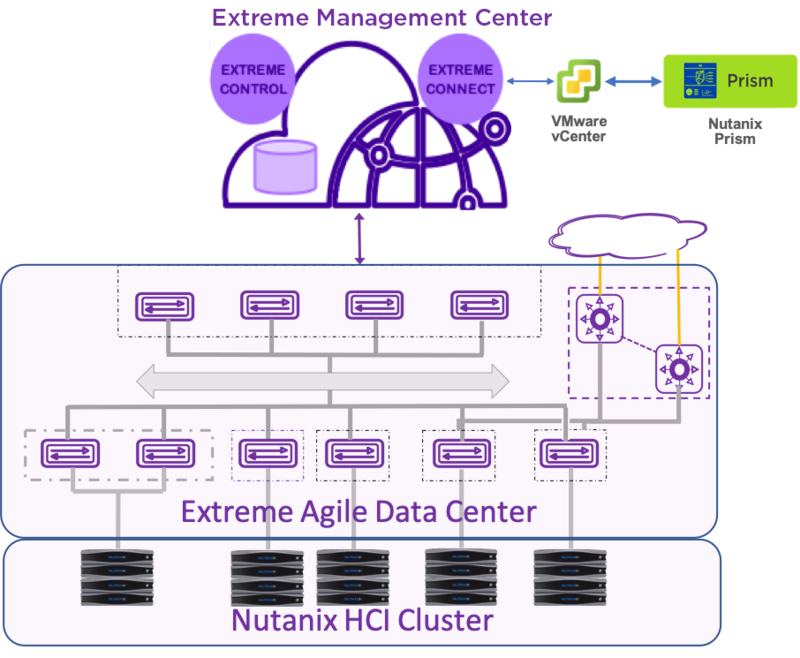 Enterprises looking to deploy business-critical workloads, virtual desktop infrastructure and big data analytics on Nutanix’s Hyper-Converged Infrastructure (HCI) Cluster can now benefit from the high-network performance and management capabilities of Extreme’s Agile Data Center solutions. Digital transformation is the industry’s favorite buzzword. But practically speaking – it’s hard and daunting. Transformation efforts require the right mix of not only organizational buy-in, but of automation, visibility, and flexibility. Joint customers using both Nutanix’s HCI Platform and Extreme’s solutions now have the tools to make digital transformation more than a word a vision board – they can go make it happen. Even better? VMware users will find it easy to adopt both Extreme and Nutanix technologies through existing integrations, giving users the best in virtualization, infrastructure and networking. Through Nutanix’s Prism Central Web Console, customers can provision networks automatically, using the Zero Touch Provisioning (ZTP) feature available in Extreme Networks’ SLX switching platform in combination with Extreme Management Center software. ZTP delivers a granular view of everything on the network – users, devices and applications – all through an intuitive single user experience. From this single view, administrators can manage inventory and network topology, set policies, and enable data center services. Going beyond the performance and ease of deployment benefits, IT can also take advantage of our switching platform and Extreme Management Center to easily scale out networks with a fabric-based architecture. Through the SLX platform, users can take advantage of Extreme Workflow Composer to improve IT agility by automating the entire network lifecycle. Finally, Extreme’s switches offer an advantage in providing network security in virtualized environments. Currently, it is difficult to align network connectivity and services with virtual machines, and current best practices can expose enterprises to VLAN-based network attacks. Extreme can minimize that through end point tracking, available on SLX switches. Working through Extreme Management Center and an integration with VMware vCenter, end point tracking dynamically authenticates and authorizes every virtual machine based on its MAC address and port group membership, providing a simple, secure manner to connect virtual machines to the physical network. Want to Check it Out Yourself? This blog was co-authored with Nanjunda Somayaji. Nanjunda is currently a Senior Solution Architect at Extreme Networks. He has more than 20 years of experience in the industry with tenures at Amdahl, Sun Microsystems, VMware and Brocade prior to joining Extreme Networks., In his current role he closely works with Extreme Networks and various strategic partners such as Nutanix, VMware, Microsoft and AWS Product Groups and Engineering as a Partner Solution Architect to define and architect Cloud based solutions involving partner products and technologies.